Clear by Digital Check is a revolutionary new image enhancement system that ensures even the worst quality checks are successfully processed the way they’re supposed to be – as readable images capable of clearing. This saves banks and credit unions an incredible amount of time and money they would otherwise spend on handling exception items and Non-Conforming Image (NCI) rejections. 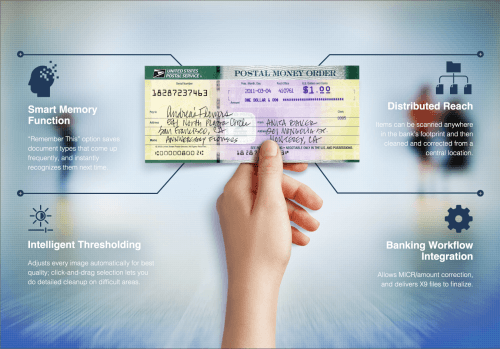 The original version of Clear allows back-office operators to manually “clean up” bad images with a click-and-drag selection tool, while the new Clear Inline™ image enhancement system for ATMs and self-service environments can automatically identify and repair problem images on the spot. A stand-alone windows application used to assist with bad images during Day 1 functions such as keying and balancing. A distributed method of cleaning and clearing bad images from a variety of capture points (spokes) from the central hub. A stand-alone windows application used to retrieve Day 2 non-conforming images (NCI) from the bank’s long term archive in order to cleanup the images for clearing. Technology that provides an additional automated “Image Perfection” inline workflow process to a bank’s existing image based payment processing solution.